Lighting Upgrades, Commercial Lighting, Industrial Lighting, Retail Lighting, Electricians - Current Technologies Ltd.
Energy-efficient lighting generally is considered the easiest, most profitable investment compared to other energy-saving building systems. Lighting upgrades in commercial and institutional facilities generate an average project payback period of a little more than 2 years, with a 45% return on investment. 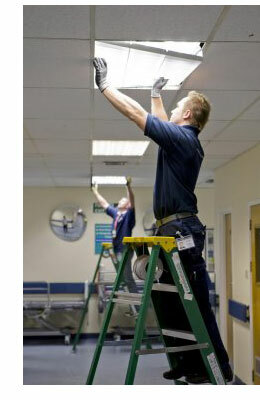 One way to reduce the cost of operating an older lighting system is to replace it with a newer, more efficient system. Another way is to upgrade existing, obsolete lighting systems with energy efficient lamps, ballasts, fixtures and controls- staples in new buildings because of energy codes. Both strategies are designed to help maintenance and engineering managers lower energy use and save on utility costs. We specialize in commercial, industrial and retail lighting installations, including maintenance and repair of these systems. We have a great team that has the experience and knowledge to get the job done right. Our team can handle your job from beginning to end, from planning to implementation to maintenance. We will make sure your systems coincide with commercial lighting standards and the necessary codes, as well as work with building and fire departments and engineers. Our clients know that we can handle the large aspects as well as the details so that they can get on with business. Whether you are lighting the factory floor, a commercial office or require special lighting environments inside or outside, take advantage of our expertise to plan and implement cost-efficient, high-efficiency lighting systems that meet today's commercial lighting standards. Today's technologies offer you an unprecedented range of lighting choices to save energy. It's good for the environment and it's good for your business. Current Technologies can help you save up to 50% or more on your lighting retrofit and take advantage of SaveOnEnergy incentives to pick up half the cost!